Many schools are moving away from celebrating religious holidays. There are both Easter and spring-themed crafts and ideas you can use at school. If your child’s school chooses to celebrate the holiday, here are some tips. Talk to your child. Remind him or her of your family rules about food. Helpful rules include having your child check with you before eating any food and not sharing foods. 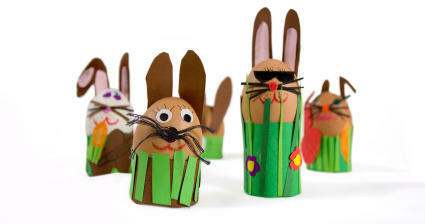 Use craft sticks, colored plastic spoons, or small brown paper bags to create chick or bunny puppets. Make maracas by putting beads into a plastic egg. Use fun, patterned tape to seal. Make little bunnies and chicks from pom-poms, felt pieces and googly eyes. Create flowers using pipe cleaners and tissue paper. Have children create masks using paper plates, construction paper and a craft stick. Allow children to use pipe cleaners, felt, foam stickers, markers, and their imagination to make little critters from plastic eggs. Have children make handprints in the form of a cross using paint on construction paper. Make a cross using craft sticks. Drape with purple ribbon or fabric to signify Lent. Make a stained glass window by gluing pieces of tissue paper between two sheets of waxed paper. Allow to dry, and form into desired shape. Additional craft ideas can be found online. Many chain stores also carry inexpensive craft kits for children. Host a spring-themed poetry reading. Have children make puppets and then create and perform short skits using their puppets as characters. Host an Easter Egg Scavenger hunt using plastic eggs. Fill eggs with clues about characters you have read in books during the school year. Have children work in teams to guess which characters are being described by the clues. Host a classroom or school-wide art show. Do the Bunny Hop or the Chicken Dance. Host an Easter or spring-themed obstacle course or fun run. Have the class count down to the first official day of spring or to Easter Sunday. Have children track weather such as rainfall, inches of snow, days of sunshine, and temperature. Create graphs and charts based on their data. Have children write and solve their own word problems based on the data. Grow plants/flowers. Have children track their growth. Allow children to take plants home as a gift for their family before Easter or spring break. Do lessons related to spring (photosynthesis, parts of a plant, how a seed grows, life cycle of a chicken, habitats of bunnies). Host a classroom science fair to allow students to show what they have learned. Download and share our handout with your child's teachers. Easter is an important time of year for Christians. Amid all the excitement of a visit from the Easter bunny, it is also a great time to discuss and reinforce your family’s religious beliefs. Attend Easter service together. Discuss the message as a family. Read a story or watch a movie about Jesus. Host an Easter egg hunt for family and friends. Fill eggs with safe treats (see ideas below). Decorate Easter eggs together. Make up fun awards for each other (for example, silliest face painted on an egg; egg that looks most like a sunset). 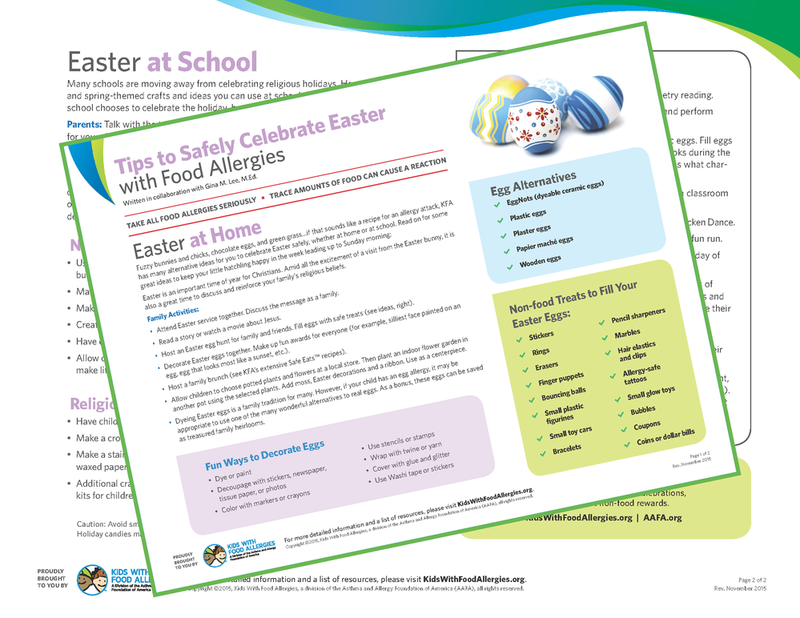 Host a family brunch - find allergy-friendly menu suggestions or search the Safe Eats® recipe collection. Allow children to choose potted plants and flowers at a local store. Then, plant an indoor flower garden in another pot using the selected plants. Add moss, Easter decorations and a ribbon. Use as a centerpiece. 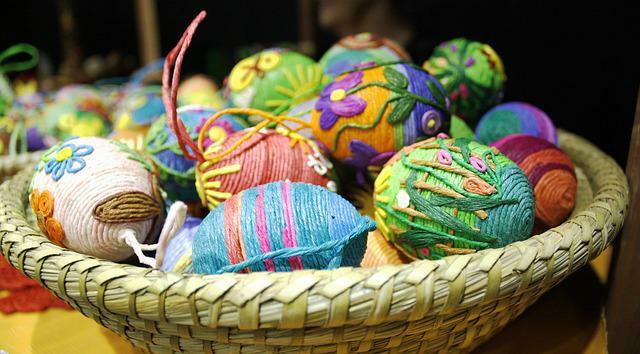 Dyeing Easter eggs is a family tradition for many. 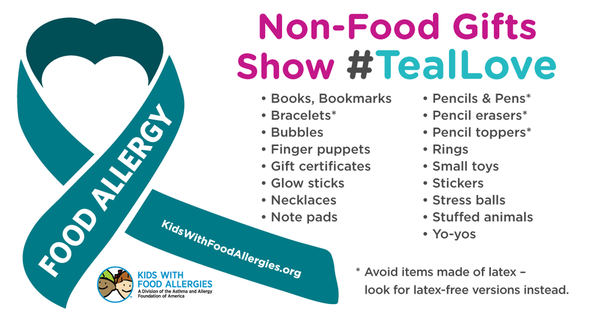 However, if your child has an egg allergy, it may be appropriate to use one of the many wonderful alternatives to real eggs. As a bonus, these eggs can be saved as treasured family heirlooms. Share these ideas with friends and relatives who will be giving your child an Easter basket. Fill plastic eggs with small, non-food items. Avoid small items for children that are very young, as they can be a choking hazard. For more ideas, see KFA’s Non-Food Rewards Handout. If you choose to include food items, remember that seasonal candies may be manufactured in a different facility than their regular-sized counterparts. Be sure to check the labels and also find out the manufacturing practices of your favorite treats. 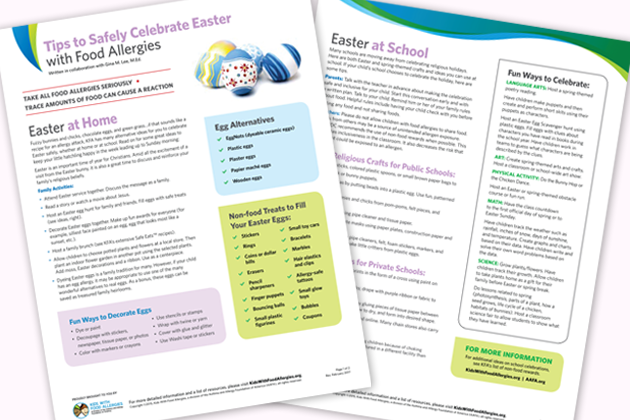 You can find options on our Allergy-Friendly Easter Candy Guide.